Fusion-io is working on the ioDrive Octal, a new 10TB solid state disk solution for servers. The product will start shipping in Q1 2012. 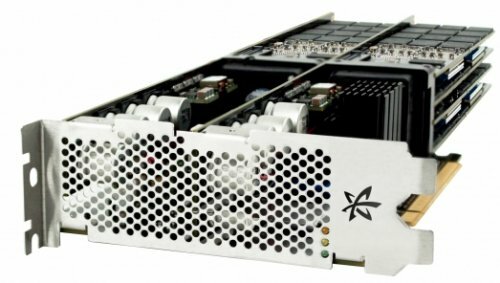 Fusion-io (NYSE: FIO) today announced the 10 TB ioDrive Octal, delivering up to 20 TB of flash-based acceleration in a 1U server, such as the Supermicro SuperServer 6016GT-TF. The 10 TB ioDrive Octal features double the ioMemory capacity and density, integrating eight 1.28 TB MLC ioMemory modules in a single double-wide PCIe device, to deliver increased capacity in the small footprint. Powered by Fusion’s VSL software platform, the ioDrive Octal allows even very large data sets to be accelerated within the server for extremely low latency performance. Designed to accelerate read-heavy workloads, the 10 TB ioDrive Octal is ideal for data warehousing, scale-out architectures, research and supercomputing. In addition, the 10 TB Fusion ioDrive Octal now offers similar capacity to many memory arrays, enabling Fusion-io VARs and Technology Alliance Program members to build customized Fusion Powered appliances. The lightweight footprint of the ioDrive Octal allows customers to significantly reduce power consumption and costly rack space while controlling datacenter sprawl and accelerating their applications. The 10 TB ioDrive Octal will be available in Q1 2012.